"Good luck to the representatives of a nation who have to implement a thing which doesn't exist." It may only be Wednesday but it's already been a big week for the ramshackle collapsing train that is Brexit. On Tuesday evening, Theresa May saw her withdrawal agreement soundly defeated in the House of Commons, while opposition leader Jeremy Corbyn tabled a motion of no confidence. 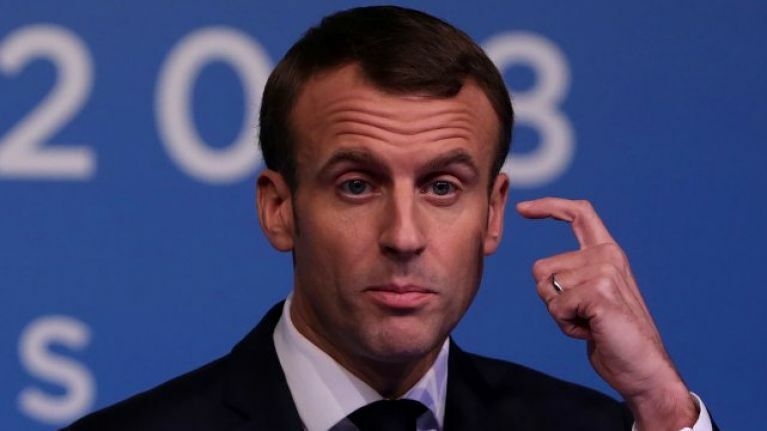 Having learned about the latest grim chapter of Brexit towards the close of a seven-hour town hall meeting in Normandy, French President Emmanuel Macron offered an emphatic take on the matter. "I'm going to tell you how I see things," he began. "First option, the British go towards a no deal so they say there is no agreement. It scares everybody. The first losers of this are the British people. "So, in this context they will have to - without any transition period - renegotiate a future relationship," Macron continued. "I can tell you very solemnly that in the framework of this future relationship, the interests of French fishing will be defended and we will have to negotiate a transition period with them anyway because the British can't afford not to have a plane taking off or landing in their country and 70% of their supermarket supplies comes from continental Europe." Moving onto the second proposed option, Macron adopted a tough stance on what he anticipates will happen. "Second option, they tell us 'We will try' - I think that's what they will do. I know them a bit. 'We will try to improve what we can obtain from the Europeans and we'll vote again'. "In that case, we'll look into it. Maybe we'll make improvements but I don't really think so because we've reached out limits with the deal and we won't, just to solve Britain's domestic political issues, stop defending European interests." With that said, Macron outlined a third option before finally rounding on the chaos that we're currently witnessing. "There is a third option," he noted. "Which is - I think they will start with the second option and it will end with the third option. Let's bet. I take my chances, which is to say, 'We will take more time' and they will ask to have a longer transition period to renegotiate something. "So they will take more time. Maybe they will step over the European elections to find something else. But, in the time we are living, it says a lot about referendums which seemed nice can create. "It's a referendum that has been manipulated, manipulated from outside by a lot of what we call fake news, where everything and anything was said and now they are being told, 'Figure it out yourselves'. "Result: It is not true. We (the Leave campaign) have lied to the people and what they (the public) have chosen is not possible. "Good luck to the representatives of the nation who has to implement a thing which doesn't exist and has to explain to the people: you have voted on a thing, we lied to you."